How Much Would Petrol Have To Be For You To Buy One Of These? dunno, see what new batteries cost and depriciation is. Depriciation is the killer for me. Id like one of these 75mpg Seat ibizas, but given i can buy a nicer, better looking, more comfortable, faster, though much less economical secondhand Korean car with fairly low mileage for £1000, im not going to get one. 100 mile range - no doubt at a constant 30mph. What range if using all the performance and how long do those batteries last and how much do they cost. Think I'll stick to the Jag. Not much, and that is the problem. 100 milles isnt enough either - 200 mile actual range and those cars become somewhat more useful. Chance of getting a charge away from home almost zero for most people. Still worse is that people who would most benefit from the money saving probably have no drive (or garage) they can even charge at home from. If you don’t drive more than 70 or 80 miles a day, and evidence from Nissan suggests that more than 80 percent of us don’t, then the Leaf might just be the perfect planet-friendly transport for you. On about 355 days out of 365, I don't drive more than 70-80 miles a day. But I do on the other ten, and for those trips this car would be useless. In that scenario I'd either have to use public transport or hire a car for occasional trips to the relatives in London and long-distance journeys to business meetings. And given that the battery pack is built into the chassis, there wouldn't even be the option to swap a dead one for charged one at a motorway service station, which AFAIK would be the only practical way to run an electric car with a larger effective range based on today's battery technology. When its range is the same as a normal car, it can be charged up fully overnight, it is reliable, and costs the same to buy and maintain then I will probably get an electric car. I think that day is several decades away. And it could very well be a defining moment in automotive history on the way to cleaning up emissions and weaning us off fossil fuels. What's the power station burning to generate the charge? If these become popular, motoring electricity will be taxed. How will the increased grid capacity be provided? How long before the batteries need replaced and how much will this cost? I'm guessing 1 or 2 years at most, and a good few thousand pounds. i would rather stick to my 19mpg i get at the moment...its a horrible car.. It's possible that even with a conventional power station generating the power it's still more efficient than burning its own fuel. I've no idea - it could just as well be less. Even if you don't do many long journeys you'd have to do so few that it's worth hiring another car just for them in order to buy this thing, so it'll be useful for hardly anyone. 150+ miles at motorway speeds and recharge in <5 minutes is the only way electric cars will ever become mainstream. Why the assumption that cars will have to fit our current expectations? I think in the long run people's expectations are going to have to change a lot more. That's right and not necessarily for the worse either. A Director of Mitsubishi Heavy Industries told me battery powered cars for the mainstream are 30 years away. Great car. They tested a couple on Top Gear. Great looking and very fast. The two they had broke down but I don't hold that against them as it's technology in its early stages. Powered by loads of mobile phone-type batteries. Very expensive and took a long time to charge but with development that's a car I would hapily drive, whereas the GeeWhiz is just embarrassingly bad. I really like the idea of electric cars - cheap fuel, few moving parts, fast acceleration, quiet - but they're not there yet. And in terms of "saving the planet" they're an irrelavance because, as has been pointed out, most of the electricity comes from burning fossil fuels. Five grand buys you a very good second hand Jag. That leaves you £15,000 change to spend on petrol and road tax and you dont have to drive a horrible little car. If petrol doubled in price I would not buy an electric car. I would do more miles on my Triumph and less in my Jaguar. No chance whatever of prising my wife out of her 4wd no matter what petrol cost. Just sort public transport out. Seriously. 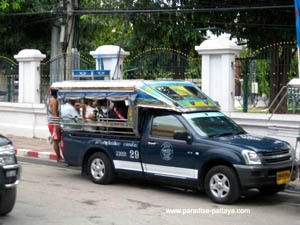 This system of little truck based buses (Baht buses) going round and round works and it works well. I'm happy to use public tranport when it suits - I occasionally use a park and ride because it is cheap (£1) with a regular shuttle running to a reasonable time and good drop off points - but most of the time it doesn't. If there was public transport that could get me door to door in a similar time to driving it then I would use it. I was about to offer a punt on how long it would take me to get to work on the bus, but I decided to look it up. So assuming they're all on time leave home 6.55, arrive at work 9.30 (late). 2hrs 35 minutes. By car it's about 30 minutes. I won't bother looking up the return journey as I couldn't face that first one. Train is leave home 6:30 to get to work at 9:20 (late). 2hrs 50 minutes. Going by car is also a fraction of the price of either. Cycling is a no-no because of the very fast twisty roads. If the price of petrol really shot up without wages moving then at £5 a litre I would be ok, but at £10 a litre I would definitely move either job or home or get an electric. I only use these buses these days and you rarely wait more than a minute for one in the towns. Inter city transport by coach, round town using Baht Bus. It's just so easy here. This is a very good series of talks from the Singularity University. Bob Metcalfe, founder of 3Com and co-inventor of Ethernet, gives a lecture at Singularity University (www.singularityu.org) in July 2009. Metcalfe outlines the Enernet, applying the Internet model to one of the most pressing issues facing the globe today, energy. I'm not opposed in principle to making the minor lifestyle changes needed to use one of these things: i.e. owning one for the 90% of the time when I don't need to do more than 100 miles in between eight-hour charges and hiring an ICE car for the few days a year when I do. It's the overall cost that I'd baulk at. The topic starter is correct in that the pertinent question is 'How much petrol would you have to buy ... ?'. Until the cost of buying and running an electric car is not only similar to that of an ICE car, but cheaper enough to make it worthwhile living with the restricted range, only trendy, greenie, Islington-dwelling Guardian readers on six-figure public sector salaries are going to bother buying them. That having been said, you've got to start somewhere. The first generation of any radical new technology generally isn't commercially viable straight out of the box, and it takes that initial group of customers with more money than sense to get the ball rolling. The first home computers cost several grand in 1970s money and were in effect little more than executive toys. The first generations of passenger aircraft could not fly in anything other than perfect weather, and so on and so forth. I don't doubt that eventually electric cars will be viable replacements for ICE-powered ones, but we're certainly not there yet. The Nissan Leaf isn't really in the market sector where electric cars are likely to sell well. However, it's going to be the only electric car in the same size category as the VW Golf, Ford Focus etc. so it will will have that niche to itself for a year or two - probably until the planned electric version of the VW Golf is launched in 2013.. I think the growth area for electric vehicles is in sectors where long range isn't important. In particular small commuter cars and urban delivery vans. An electric car wouldn't suit all our motoring needs but we run 2 cars and I'd be happy to try an electric car as our second car when the price is right on the secondhand market. I do think that many more cars will be electrically propelled in the future - in the form of range-extender plug-in hybrids like the forthcoming Chevrolet Volt and Vauxhall Ampera. These are basically electric cars with an engine and generator that top up the battery when it starts to run low. The Chevrolet Volt is said to do about 40 miles on battery power before the engine cuts in. So for a lot of journeys the engine wouldn't be needed.